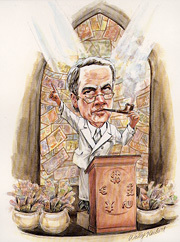 Economist Steve Hanke has become an evangelist for currency boards in emerging nations. Governments are lining up for his counsel. But not everyone share his zeal. If Steve Hanke's life had a soundtrack, it would be full of telephones. There are hours of the day when the phone in his Hopkins faculty office rings every 10 minutes, every five. He takes each call, making any conversation with him a patchwork. Brrringgg... "Hello? Hi...I'm in an interview now...give me 15 minutes or so." The constant calls and the overheard fragments of conversation convey the impression that Hanke is a man of the hour, an important figure in the borderless bazaar of international trade. It's an impression that he doesn't mind in the least. In the estimation of the magazine World Trade, Hanke was one of the world's 25 most influential people in 1998. When he speaks on the subject of currency crises and monetary policy, governments and economists listen; some agree, some scoff. He has squared off against the International Monetary Fund, the Clinton administration, and a variety of academic economists. He is dead solid sure that he is right, and he thinks the rest of the world is starting to come around to his way of seeing things. "We're winning the war big-time," he says. "The enemy is in such fast retreat you can barely find them." The "war" is over what, and who, determines the value of a nation's currency. Currency is a curious institution. We assign to it the value of almost everything, yet, in the absence of, say, the gold standard, it has no fundamental value unless certain people--bankers, speculators, traders, investors--have faith in it. If enough of those people lose faith, and it's your currency, you may go bankrupt, or hungry. Nations try to assert some control over the value of their currencies, mostly through central banks like the U.S. Federal Reserve and the Bank of England. Supporters of central banks, which include the IMF and eminent economists, say they are necessary to control inflation, lower interest rates to combat recession, finance government deficit spending, and temporarily support financially troubled institutions. In Hanke's view, central banks, at least in developing countries, are the enemy. "The Achilles' heels of these countries are their crummy little central banks," he says. "They basically make everyone poor." He believes that the banks' record makes clear that they cannot be trusted to make prudent decisions, that they are susceptible to political pressures and poor judgment and tend to do more harm than good. Put them in a straitjacket, Hanke argues, or abolish them altogether. The tools for doing so, he says, are currency boards and dollarization. The former is the straitjacket: A currency board wrests control of the exchange rate and the money supply from the hands of the central bank and politicians. Dollarization is, in Hanke's words, "the hangman's noose": It abolishes the central bank and replaces the local currency with a stronger foreign currency. Twenty years ago, there was little discussion of either. Now, they are front and center in debates about the international monetary system, and Hanke is front and center as well. He likes it there. Hanke came to international attention in 1998 when he went mano a mano with the IMF during Indonesia's economic crisis. Amid that turmoil, you could almost hear the cry: Who the hell is Steve Hanke? And from some of those who knew the answer: Who the hell does Hanke think he is? Brrringgg... "Sigrid, hi...I'm a little busy, but did you find out anything?" So... who the hell is Steve Hanke? Depends on whom you ask. Paul Krugman, professor of economics at M.I.T., has called him "a self-promoter whose image as a successful country doctor has been pumped up by r�sum� inflation." Lars Jonung, former chief economic advisor to the prime minister of Sweden (and occasional collaborator with Hanke), says, "Steve is competing with some of the strongest names in the profession, like Krugman, Stan Fischer, and Jeff Sachs. Steve has been proven correct and successful as a policy peddlar, and that creates criticism. Especially from those...who cannot express themselves as forcefully as Steve." Hanke is a professor in DOGEE, Hopkins's Department of Geography and Environmental Engineering, and in Economics. Though it's been more than a decade since he devoted much study to environmental issues, he has covered a lot of geography, since 1990 advising the governments of Albania, Argentina, Estonia, Lithuania, the former Yugoslavia, Venezuela, Bosnia, Bulgaria, Indonesia, and lately Montenegro, on how to stabilize their currencies. He was a senior economist in the Reagan administration's Council of Economic Advisors from 1981 to 1982. He's chairman of the Friedberg Mercantile Group, a New York'based currency and securities trading firm, and president of Toronto Trust Argentina, an emerging-market mutual fund that over the last five years has turned in the second-best results of any fund in its category, according to Standard & Poor's Emerging Market Fund Monitor. He smokes a pipe, invariably refers to his wife, Liliane, as "Mrs. Hanke," has decorated the walls of his office with photographs of himself standing next to various world leaders, and prefers to be pictured peering over a set of reading glasses. He is a professor who derides academics. He says, "Even though I refuse to get up close and personal with economists, they know that I hold all but a few in contempt and that I believe that economics has been in decline for decades." He likes to take shots at "the chattering classes," but as a columnist for Forbes, he's something of a chatterer himself. He sends reporters a steady stream of notes, updates, and press clippings about himself (I've received as many as three envelopes in one week, and clips in French, Spanish, and Bulgarian), but bristles at the notion that he's self-promoting. A high profile is no doubt good for business; Hanke says that he courts the press because it's his job to propound good ideas: "If no one sees about this stuff, no one knows about it. I'm not interested in writing for profound journals that no one reads." If you ever want to set him off, refer to him as "an obscure economist." "Even though I refuse to get up close and personal with economists, they know I hold all but a few in contempt." "If I see that one more time," he says, "I'm gonna lose my mind." Brrringgg..."Yeah...hi.... It looks like we'll end up with the whole thing using currency boards." Raised in Iowa, educated at the University of Colorado, Hanke came to Hopkins in 1969. Tenured as a full professor six years later, he worked mostly on issues of resource management. Then something new caught his attention. In 1983, Sir Alan Walters, a former Hopkins faculty member and an advisor to Margaret Thatcher, stabilized the volatile currency of Hong Kong with something called a currency board. A currency board does two things: It anchors the value of the local money to a stronger currency at a fixed rate of exchange, and requires that every unit of the local money be backed by reserves of the anchor currency. A currency board law prevents a central bank from printing excess money. What's wrong with a central bank printing more money? When a nation's economy suffers a downturn, demand for its currency declines. Importers aren't buying its products, so they don't need its currency. Investors go elsewhere for better returns and less risk. Consumers buy and borrow less. If the central bank chooses to print more currency, in hope of stimulating the economy, it increases the supply as the demand is going down. As anyone who ever sat through Econ 101 can tell you, when supply goes up as demand is going down, the value drops. And when the value of a currency drops, that nation's citizens suffer inflation (sometimes severe), investors stop bringing in capital, and the country becomes unable to pay its external debts. By implementing a currency board, a government voluntarily ties its own hands, and those of its central bank, as if saying, "Stop us before we print again." Because the board automatically balances supply and demand at a fixed exchange rate, it restores some confidence that the currency will hold its value. Currency boards hardly solve all economic problems (nor are they meant to) and, say their critics, they create new problems of their own, but where they've been used, hyperinflation has stopped, balance of payments crises have eased, and their nations' international trade has regained some equilibrium. Curious about what Walters had done in Hong Kong, Hanke began researching the history of currency boards, which goes back to 1849. While digging through the British Archive in London in 1990 with a Hopkins postdoctoral fellow named Kurt Schuler, he discovered that no less than John Maynard Keynes had implemented a currency board in northern Russia, amid the chaos of the Russian Revolution in 1918. "The more I studied their history," Hanke says, "the more I found they worked every- place." He found more than 70 examples of successful boards in countries as diverse as Ireland, Iraq, and Panama. Hanke began publishing his research; to date he has coauthored 17 books and monographs on the subject. He also began advising governments on how they might implement a board. In 1990, he worked with Schuler and an Argentinian legislator, Jos� Maria Ibarbia, to draft a currency board plan for Argentina. The Argentine government established a board the next year, and saw its inflation rate plunge from a ruinous annual rate of 2,314 percent in 1990 to .09 percent in 1998, according to International Monetary Fund figures. Hanke was off and running. He helped establish variations of the boards in Estonia (1991), Lithuania (1993-94), and Bulgaria (1997). By 1998, Hanke had established himself as an evangelist for currency boards in emerging nations. The work appealed to him. In the May 1998 issue of Bloomberg, he is quoted: "I like to get into a situation where there's a big mess and the job is to clean it up. I don't much like routine work." By that point, he'd found just the sort of mess he liked, in Indonesia. Brrringgg... "Hello? Yeah...I just don't trust the SOBs...."
Hanke, with wife Liliane, meets with Peter Stoyanov, president of Bulgaria. In 1997, Indonesia's economy had been growing at a healthy rate of 6 percent per year for 32 years. But then one Asian economy after another began to collapse, starting with Thailand. In August 1997, the Indonesian government, with the IMF's blessing, responded to pressure on its own economy by letting its currency, the rupiah, float on the world's markets; henceforth the market, not the government, would set the currency's value. But the rupiah didn't float. It sank like a bag of cement pitched from a rowboat. International bankers, investors, and currency speculators had taken a hard look at Indonesia's economy and decided it was headed for the same crash that had just wrecked Thailand. They did not want vaults and portfolios full of rupiahs that would not buy anything in a ruined economy. So they bailed out. (Among those who made money short-selling rupiahs was the Friedberg Mercantile Group. Hanke, Friedberg's chairman, says that by the time he began advising the Indonesian government, Friedberg no longer held the currency: "Our policy at Friedberg's is to avoid positions in countries where I have an official position. And we have never broken the guidelines. The exception to this is where we have permanent offices, and Argentina is the only relevant case.") Within five months, a currency that had traded at 2,425 rupiah to the U.S. dollar now traded at 17,000 to the dollar. Businesses went bankrupt, financial institutions tottered, and savings-depleted Indonesians rioted when they saw they could no longer afford rice or cooking oil. When a nation's economy hits the pavement, that nation usually turns to the International Monetary Fund for help. The IMF loans massive amounts of money to bail out troubled economies, but only if it gets to dictate how those economies will function in the future. Most countries accept the IMF's terms, because they have little choice. By February 1998, Indonesia appeared to be next in line, forced to drastically reorder its economy in exchange for $43 billion in emergency loans. Then Indonesia's president Suharto surprised the world's financial community by taking on a new advisor: Hanke. Word spread that Indonesia intended to adopt a currency board. The IMF and several major Western governments were livid. Bill Clinton phoned repeated warnings to Suharto. (Hanke says he was with Suharto when three of the calls came in.) So did the Germans and Brits and Japanese and Australians. The IMF threatened to take its $43 billion and go home. Hanke was undeterred. He tends to be blunt, and minces no words in describing what the IMF wanted Indonesia to do in exchange for its billions: "It was absolutely the most stupid program I had ever seen, and the [international] markets reflected that. The markets just annihilated the currency." Indeed, when Suharto had first agreed to the IMF's conditions on Janurary 15, 1998, the currency declined 10 percent in that one day. The IMF insisted that Indonesia reform its banking system, privatize its industries, break up the cartels that ran the country's business, and make other sweeping reforms. Suharto, with Hanke's agreement, believed that he could not remain in office and do what the IMF wanted while his people were trying to survive with currency that day by day was becoming worthless. Before anything else, Suharto believed, he needed to stabilize the value of the rupiah and restore some calm to his country. Not coincidentally, Suharto saw that as the only way to stay in power. Says Hanke, "I had no beef with the individual parts [of the IMF's plan]. The problem was, a program that would lead to a lot of long-term benefits had all the political costs to Suharto front-loaded." He believes that the governments of the U.S. and other Western heavyweights knew Suharto would probably fall if they pressured him to comply with the IMF plan. He cites a June 1998 statement by former U.S. Secretary of State Lawrence Eagleburger, made at an economics conference: "We were fairly clever in that we supported the IMF as it overthrew [Suharto]. Whether that was a wise way to proceed is another question." In February 1998, when rumors spread that Suharto was considering a currency board, the value of the rupiah immediately shot up 28 percent on world markets. Hanke sees that as a ringing endorsement of the plan, but the IMF was unmoved. Suharto attracted little sympathy in the West; he was commonly regarded as a corrupt dictator who had enriched his family and cronies and was much overdue for reform. Critics argued that this currency board thing was merely a way for Indonesia to dodge the IMF's austerity measures and the reforms that Indonesia would have to adopt in the long run. They also suspected that Suharto's friends and family members hoped to save their personal fortunes by cashing in rupiahs and using U.S. dollars to pay down their own massive debts. (Hanke notes that the Suharto family holdings were almost all real assets, not cash: factories, airports, toll roads, etc.) Hanke and Suharto worked up a plan called "IMF Plus" that included the IMF's reform measures but mandated, among other things, a currency board. The IMF replied that it would agree to a modified plan: IMF Plus minus the currency board, at least for now. Hanke likened it to the fire department saying it will save your blazing house, but only after you've complied with the fire code. Suharto finally yielded to pressure and met the IMF's terms on April 10. On May 4, the IMF mandated an increase in the price of fuel. Indonesians rioted again, and the violence intensified until Suharto resigned 17 days later. Brrringgg... "Hello? Yeah. Yeah. I sent the book cover. I'm cranking away on the review." The debate and the news coverage pushed currency boards to the forefront, with Hanke as the standard-bearer. "It made currency boards come out of nowhere," he says. "Most professors of economics didn't know what they were. Now they do." During the Indonesian crisis, Hanke took some shots. Krugman, the M.I.T. economist, called him an "economic snake-oil salesman" and "the Rasputin of the rupiah." The IMF and spokesmen for the Clinton administration campaigned hard in the press against an Indonesian currency board. A footnote in a June 1998 research paper by Charles Wyploz of the Graduate Institute of International Studies in Geneva said, "While [the criticism] may have looked as witch-hunt [sic], it was important that a dangerous advice be exposed as outside the mainstream." "If you're in this game, you gotta be able to take a punch," Hanke says. "But this almost got to the point of a mauling." The magazine Far Eastern Economic Review seemed to agree, saying in a June 1998 editorial: "The counterattack [to Hanke's proposal] was swift and massive, leaning more to blackmail and name-calling than reasoned disagreement." It went on to say, "Steve Hanke is looking pretty good these days. If rupiah stability has been the goal...the IMF has failed to achieve it." MIT's Paul Krugman has called Hanke an "economic snake-oil salesman" and the "Rasputin of the rupiah." Is Hanke right? Are currency boards an unequivocal good thing? He states flatly, "There have never been any currency boards that have failed." He says that numbers from the IMF and the World Bank support his side: Countries with currency boards or something similar have had average growth rates 54 percent higher than countries with central banks and pegged exchange rates, and nations with central banks have suffered inflation rates 4.9 times those of currency board countries. A number of economists, including Nobel laureates Merton Miller (PhD '52), Gary Becker, and Milton Friedman, basically agree with him. One who asked not to be identified because of his work with the IMF said, "Currency boards have universally passed the test of practice." Owen F. Humpage, an economic advisor to the Federal Reserve Bank of Cleveland, agrees that boards can be useful, but he sounds some cautionary notes: "A currency board prevents a country's exchange rate from acting as a buffer against economic shocks." Citizens in developing countries, who are probably poor in the first place, will bear the brunt of an economic slump, with no central bank intervention to help soften the blow. Humpage, who is unconvinced that a board was the solution to Indonesia's crisis, goes on to say, "Because governments can always drop or rearrange currency boards, such restraints are never fully convincing. Only by repeatedly behaving in a responsible manner can a country develop a favorable reputation for monetary stability." Other economists point out that for currency boards to work, there must be a sound legal system in place to create and enforce new central banking laws (Hanke agrees). The country needs sufficient reserves to back its currency (cited as a problem for Indonesia), and it will tie itself to the inflation rate of the anchor currency, for better or worse. If your currency is pegged to the dollar and the dollar begins to buy less in, say, Germany, your currency will also buy less in Germany. Anna J. Schwartz, a research associate at the National Bureau of Economic Research (and no friend of the IMF--in a Cato Institute paper she argued for abolishing it), says that Hanke and other advocates of currency boards "are misguided in presenting them as a panacea." She adds, "It could be that a small country will be well served if it's had hyperinflation, but a currency board isn't anything that I believe will have an enduring future. The present case of Argentina is an example. They certainly helped themselves in getting rid of inflation. But they have had innumerable problems since. For example, they have high unemployment, and it doesn't help that the currency board is there." She also notes that just because the Argentine peso has been pegged at one to the U.S. dollar doesn't mean that people really believe they are of comparable worth. Argentine loans in pesos have a higher interest rate than loans in dollars because lenders have more faith in the value of the dollar. The IMF has endorsed currency boards for some countries, such as Bosnia, Bulgaria, even Russia. But it still supports use of the central banks. When asked why, William Murray, spokesman for the IMF, merely replied, "I think the IMF's position on currency boards is oversimplified by Mr. Hanke and others. I suggest you visit our website and look through speeches and other presentations by officials." An examination of some of those presentations revealed no clear-cut statement. Sir Alan Walters, who established Hong Kong's board, says, "The IMF has been astonished by the success of currency boards in Argentina, Estonia, etc." Hanke and some of his supporters see something else at stake. Christopher Culp, an adjunct associate professor of finance at the University of Chicago and managing director of CP Risk Management LLC, says, "If Dr. Hanke's ideas are implemented, a lot of people in organizations like the IMF would find the raison d'�tre for their jobs called into question. To the average IMF worker, a policy that eliminates the need for an IMF role is not exactly the best way to ensure continuing employment." Adds Lars Jonung, "The IMF is the central bank of central banks. The IMF thus has a vested interest in central banking and actively preventing the establishment of currency boards." Hanke gleefully supplies examples of world figures coming around to his side: The economic advisor to Megawati Sukarnoputri (most likely the next president of Indonesia) has said he now believes Hanke was right about a currency board for that country; outgoing U.S. Secretary of the Treasury Robert Rubin, in an April speech at Hopkins's Nitze School of Advanced International Studies, said that emerging economies should adopt either a flexible exchange rate or a strong institutional mechanism such as a currency board; financier George Soros wrote in The Financial Times last year: "The best solution [for Russia] would be to introduce a currency board after a modest devaluation [of the ruble] of 15 to 25 percent." Hanke views this as victory. When he speaks of Indonesia, he says, "I have been completely vindicated." Brrringgg... "Hi. I had an article this weekend in La Nacion, which is the largest newspaper in Buenos Aires. ...The Chicago fed said dollarization was 'unequivocally desirable.' ...It's still hot, last week I had a flurry of reporters calling me." These days, Hanke continues to advise on currency boards, and on another strategy: dollarization. When a country dollarizes, it stops printing its own money and adopts as its own legal tender another, stronger currency such as the U.S. dollar (most often, hence the term "dollarization") or the German mark. The central bank goes out of business. One country considering such a move is Argentina. Under the direction of its president, Carlos Menem, Argentina may simply abandon its peso and begin conducting its commerce and banking in U.S. dollars. Hanke prepared a report on the plan for Menem last February. "Unofficially, the world is dollarized," Hanke argues. "You go to Mexico or Russia and you find that everybody's using greenbacks. They don't need some damned economist or pedagogue explaining the problem with central banks." When he addresses a group in Mexico, he likes to ask audience members to open their wallets. "How many of you have greenbacks in there?" he asks. Usually, everyone in the room raises his or her hand. He notes that 70 percent of all U.S. dollars circulate not in this country, but abroad. As he looks ahead, Hanke predicts that much of Latin America will dollarize and much of Africa will go for currency boards, as will the Balkan countries. He says this will happen simply because people realize it works. "Most people are sick and tired of currency crises and getting robbed by these central banks," he says. "What's next for me is to simply follow through. In a military campaign, the worst thing is not to pursue the enemy when they're retreating." One sometimes gets the sense that Hanke is a former Iowa farm boy who can't get over where he's ended up, at the center of the action. "I cannot believe how fast the profession has come around to my views on exchange rates," he says. "However, it doesn't surprise me in the least when a head of state rings me up for advice." And then the phone rings. RETURN TO SEPTEMBER 1999 TABLE OF CONTENTS.